This coin was found in a garden treated with imported gravel of unclear origin. It is likely, therefore, that the coin has been moved from its original findspot and transported to the current location, but we do not know where the original source may have been. 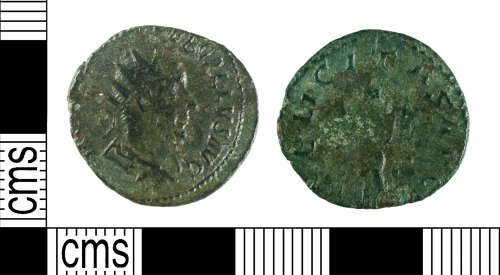 A very base, silver Roman radiate of Trebonianus Gallus (AD 251-253), dating to the period c.AD 251-253 (Reece Period 12). FELICITAS AVG reverse type depicting Felicitas standing left holding long caduceus and cornucopiae. Probably an Eastern mint (Antioch) coin. Cf. Cunetio no. 397 (RIC IV.3, no. 82var); BM 1961,0805.7.